Fan Feedback: We’ve Found Water! It’s been a long time since I’ve set foot in a science classroom, but people on our team far smarter than myself have been discussing the potential use for Hydrogen, being a combustible fuel source, in Gears of Eden. For the longest time, we’ve been trying to decide what to do with it: should the player be able to use it to sustain their power reserves? Maybe it could be used to trade with characters that lack solar panels? Or maybe it should be some sort of combination of the two! We’re still in the early stages of development so we’re not worrying too much about that … what we’re worried about is what to call the stuff! We started by calling it “WaterIce,” but we’ve been debating that decision ever since! Last week, we decided enough was enough, and that we needed to get your feedback. I’m not sure we’ve ever had such diverse range of responses to one of our polls! On top of that, I’m not sure I’ve ever been as surprised by the results of one of these polls! See, personally, I’ve been an advocate of calling the resource, “Water,” for simplicity’s sake. I honestly expected to see it win out on this poll, but as it turns out, I’m practically alone on this one. Then, the two I expected to be the farthest down, ended up being the top two poll results! 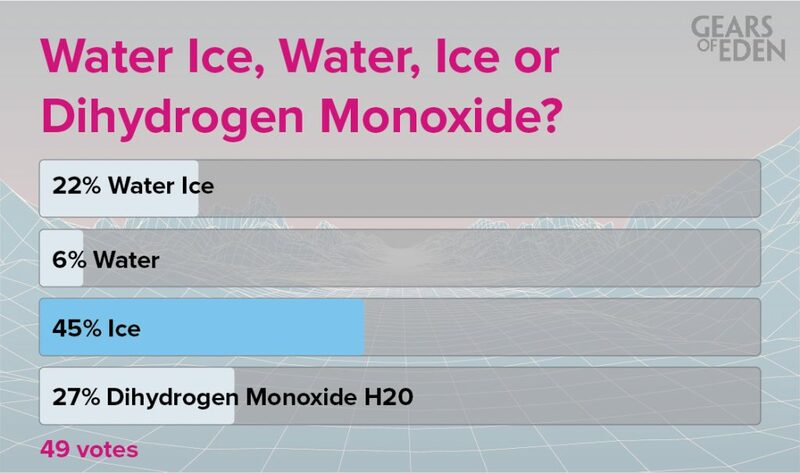 At this point, I’m surprised the Dihydrogen Monoxide H2O didn’t completely win out, simply because of how little I expected it! So, what does this mean for Gears of Eden? Well that’s an interesting question because of some of the feedback we got. First off, the two we thought to be the strongest contenders turned out to be the lowest ranked, so that’s interesting, but what of the other two? Dihydrogen Monoxide H2O ended up being a popular choice, but someone made a pretty compelling argument against it: it isn’t particularly viable if it doesn’t mesh with our current naming conventions. And it doesn’t! It would require us to rewrite the names across the board, which is certainly doable, but it may get confusing for players who don’t remember chemistry class. We’ll be thinking more about this one though! 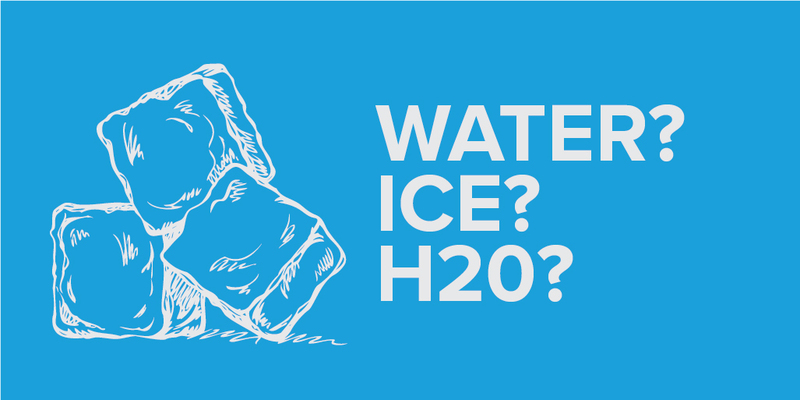 Ice is a funny one because it initially only came about because of a miscommunication; I’d meant to be arguing for “Water,” but I hadn’t been clear enough and people thought I meant Ice, and it stuck a bit. In fact, we only included it to fill out the poll, but I don’t think any of us expected it do so well! And yet, there it is, taking nearly half of the votes! I don’t know if we’re going to follow this path either, but clearly, we should give it more thought. It’ll be our decision to make, but this is some valuable feedback across, so thank you! Normally, this is where we’d tell you about this week’s poll and encourage you to vote. We’re changing this up a bit though! The polls and Fan Feedback articles are being replaced by the Reaching Eden Podcast as regular content. We made this decision for a couple reasons. First off, we don’t want the Fan Feedback articles to feel like “filler,” and if we go at this pace for much longer, they probably will! We also believe that the podcast will ultimately serve as more meaningful content for our community. Let me be clear though, Fan Feedback is not going away. We’re just laying off it a bit so you can trust that, when you participate in one of our polls, you’re participating in a live and active conversation for the Gears of Eden team. This is a big time for us, so follow us on Twitter or Facebook for all the latest news! We’ll be back on Wednesday, and I hope to see you then!